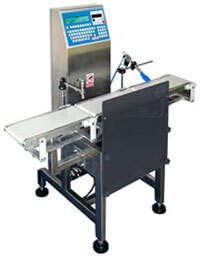 Automatic checkweighers series DWT/HL/H are dedicated mainly for systems of Control of Packaged Goods. They are designed for load with maximal capacity above 7,5 kg. They are applied by food, cosmetics and chemical industry. Stainless steel construction, control set is based on TMC weighing terminal equipped with alphanumeric keyboard, separate display for mass and 4 line text display for communication between the weighing instrument and operator. Scale is equipped with numerous additional functions, which allows for cooperation with other devices and data base systems. Scale have EC type approval, and are offered as EC verified.